We citizens of Champaign-Urbana, as well as the good folks of St. Joe, Mahomet, Savoy, Bondville, Tolono and any other town or village within reasonable driving distance, should be grateful for the Art Theater in downtown Champaign. It is an architectural treasure, a bastion of culture, a champion of artistic expression and an outlet for alternative perspectives. Opened in 1913, the Art (formerly “the Park Theatre”) has been showing films for over a hundred years, and as you enter the theater, passing beneath the glowing, neon marquee, you are transported to a time when film was something akin to magic. While they no longer employ ushers to show you to your seat and the organ has (sadly) been removed, the vaguely art deco design elements adorning the auditorium as well as the the long-sloping, carpeted aisles and the slightly stale smell of old paint remind you that you are sitting inside a piece of history. As ownership of the theater has changed hands over the years, so has the aesthetic vision of the films it runs. From the classics of Hollywood’s Golden Era to, briefly, a self-described “sordid” period where the theater showed “adult” films, its offerings have varied wildly over the years. Thankfully, over the last seven years, it has made a concerted effort to present films that would be otherwise unavailable on the big screen. From the cult classics that run as part of its “Late Nights at the Art” series to the Halloween classics of “Shocktober”, the programming at the Art, now part of the Art Film Foundation (AFF) strives “[to promote] culture and education through cinema”. And whether it’s a midnight showing of The Room, a foreign film that honestly and accurately depicts life in another part of the world or positive, mind-opening, kid-focused offerings like the “Smart Kids” series (which are free and open to the public), the films shown at the Art Theater provide a welcome respite from the CGI inanity of the ubiquitous Hollywood blockbuster. They also remind us that the medium (and the unique forms of expression that it lends itself so well to) is still magical and can be used as an often quite effective agent of social change. A great example of the cinematically unique selections shown at the Art is the Stories from the City, Stories from the State film series running this summer. A collection of five films, the series admirably fulfills the AFF’s mission of using film to educate and inspire positive change while also highlighting the output of several capable and creative filmmakers working in Illinois. Photo from The Art Theatre's website. The most recent installment featured two short documentaries that looked at the topic of education from very different perspectives. In Gadget Girls, writer/director Risé Sanders-Weir takes viewers into the lives of a group of middle school girls participating in a females-only, summer STEM camp called “Girls Adventuring in Design, Engineering & Technology” (GADgET) at Triton College. The film focuses on how the girls interact with and learn from each other as well as their instructor-mentors (especially program coordinator Antigone Sharris) and documents the problem-solving skills they glean as they work through a self-selected design project. It also highlights some of the challenges that the girls face when trying to decide whether to eventually pursue a career in a STEM field. 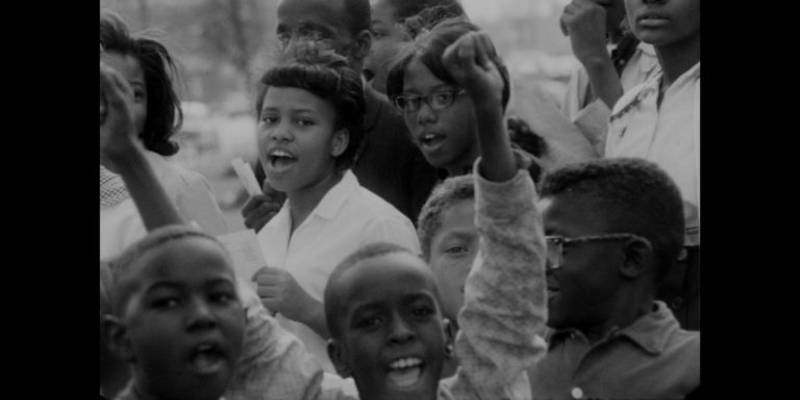 The second film of the evening, 63 Boycott, gives the audience an inside looks at the planning, organization and realization of a peaceful protest against racial segregation. Director Gordon Quinn of Kartemquin Films employs a combination of gritty, black and white,16mm footage (shot by Quinn himself) to chronicle a boycott of Chicago Public Schools in which over 250,000 students walked out one day in 1963 in protest of racist policies being implemented by then-CPS Superintendent Benjamin Willis. This archival footage is juxtaposed with full color interviews of several of the boycott participants that allow the men and women who walked out to discuss how the historic event helped shape their lives. The film ends by drawing parallels between the state of public education in Chicago in the 1960s and now, posing an uncomfortable question for the audience to ponder: how much do we actually care about providing equal education for all? After the films, there was a Q&A with both directors, which allowed the audience to interact with the films and their curators and helped negotiate clearer take-away messages. The Q&A acknowledged the fact that even documentaries are open to interpretation (especially historical ones), and it also afforded the directors a chance to contextualize their work by engaging the audience on a more personal level — an opportunity welcomed by audience members, especially given the timeliness of the subject matter of both films. Film is a powerful medium. To that end, a good director understands that a tasteful combination of light and sound, working in concert with a judicious variety of symbolic and literal meaning, can synergize to create a narrative that commands attention. Stories from the City, Stories from the State features films and filmmakers that understand how to harness the power of film in the service of deeply important and diverse messages including learning from our past mistakes and helping us understand the hopes and fears of future generations. So, while “Illinois” might not collocate as readily with “film” as “Cannes” or “Hollywood”, series like this one shed much needed and much deserved light on the people using the power of film to try and change the world. And thanks to the Art Theater, there’s a place for us here in town to appreciate their stories. The last installment of Stories from the City, Stories from the State entitled, Minding the Gap (directed by Bing Liu) will take place on, Wednesday, August 8th, at 7:30 p.m. Tickets can be purchased at the Art Theater or through their website here.